Think of how much chaos they could create together. Here is the second page of a comic about Twilight and Shining Armor when they were young. This comic put a smile in my face no matter how many times I see it. Same here. I hope more like it are done. The panel with Shining Armor putting his muzzle in the tea cup makes me laugh every time I see it. *applauds Kyderra* Good for you! Heh congrats that is very adorable! Kyderra, it was a really great artwork. Congratulation! I think the artist thought that Granny Smith was his mother for drawing her so young. That is probably the first truly Broadway-worthy number I've seen from the brony fandom, and I freaking LOVE it. And now I really want some similar numbers for some of the other popular background characters. On Equestria Daily they held a poll to see is the most popular antagonist. Personally, I voted for Queen Chrysalis. 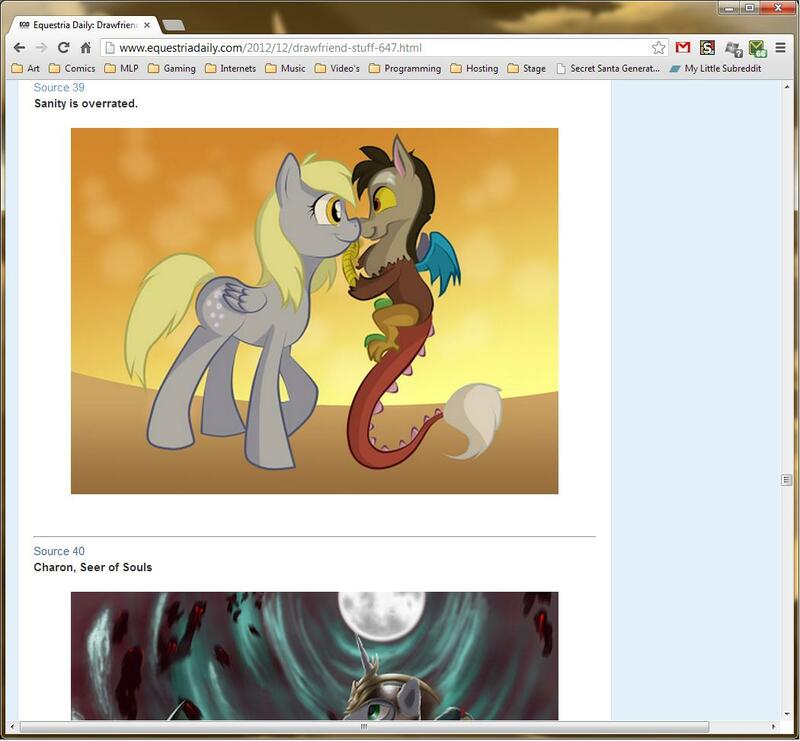 But Discord ANNIHILATED the others! He had more than 50% of the votes. In fan animation news, the latest episode of "Doctor Whooves and the Assistant" is out! quick question for my grimdark fanfic: have the CMC tried to get their cutie marks being a librarian like Twilight in any episode? I see. Thanks for telling me this. I'll go re-watch that episode before postin chapter 1. I'm writting a horror story with slender pony. I don't intend to make it like the other stories (slender pony flat out kills the CMC in first chapter). Yeah the CMC will have a good role in it, but I want to explore the sadistic nature of slender pony than just kill off characters right at the beggining (not sure if any will die, but I like keeping it open for now). I can't believe that no one has made one set to "I Want Candy" by DJ Chris. It begs for it. And its time so something bitter sweet. Gah! Why can't I hold all these things!? I'm very skeptical, but we'll see what comes of it. I think That was the best of Luna so far. Scootaloo will get even more fics of her being an orphan now. edit: @Foxstar, I'm still trying to think of the details of the story. I won't begin it if I don't have a ending for it. Also I'll only post the first chapter after I'm done with the third one. Plus I have my own doubts since I don't know how to write Applejack's accent. At all. Last edited by angelusbr on Sat Dec 08, 2012 11:06 am, edited 1 time in total. Minding Pony's dreams explains one of the things Luna does at night, she's likely as busy or more so then her sister. Ok so Luna is basically Dream of the Endless now. There was a lot more of Luna then I thought there would be I have to admit I was expecting just a cameo or two in the dreams. Rainbow Dashkicking through the trees was cool and the snoring scenes were hilarious and are going to make so many gif and memes for sure. Rarity was, well, very much Rarity in this episode which was over the top and funny as usual. This cemented Scootaloo as my favorite CMC for sure. Also hopefully the end of this episode will kill some of the whole Rainbow Dash is terrible character stuff. Over all I would give this a 8/10. Though I will admit it kind of feels like not a whole lot happened in this episode and that a lot of it was really filler, however it doesn't really bring the episode down any as what they did have was great. Is it true that the writer for this episode was a completelly new one? From everything I'm hearing yes it was. Pretty good for a first Episode I have to say. I loved this episode. It was full of best ponies. I love that Luna monitors dreams, I love that Dash is now officially Scoots' big sister stand-in, I loved Dash flying Scoots at the end there. Pretty sure Scoots is my favorite CMC. I have my own doubts since I don't know how to write Applejack's accent. At all. check out the comic. That's the canon way to write her accent. Yeah Dash and Scoots flying at the end was super adorable and Scoots having Rainbow Dash protect her in her Dream was neat as well. However now I wonder was that really Rainbow Dash or just Scootaloos Dream representation of Rainbow Dash at the end? Considering that Luna can enter dreams at will its not that much of a stretch to assume she can bring others into dreams as with her if they are also sleeping. huh, maybe. So Scoots and Dash may have been sharing a dream at the end there? Yeah that's what I'm going to assume until its proven otherwise.